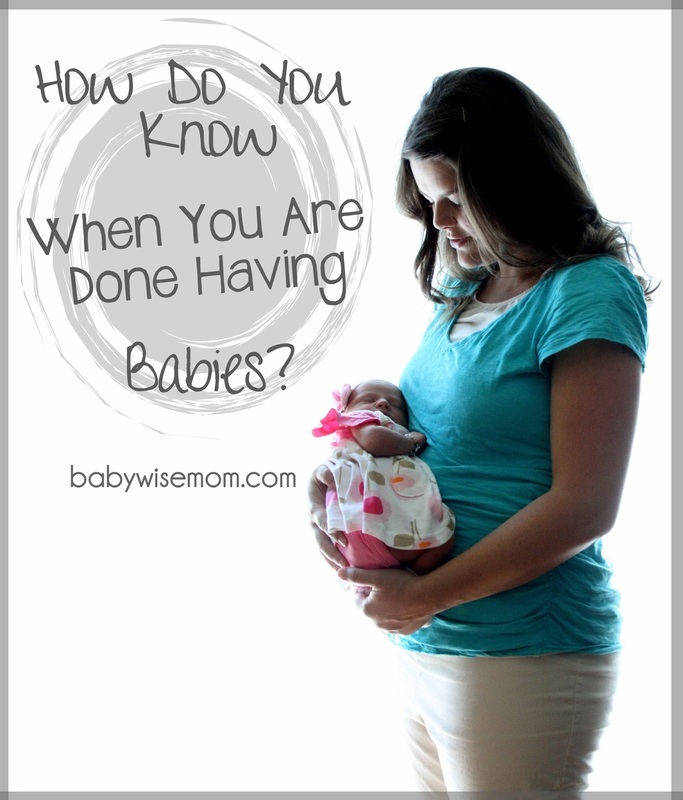 How Do You Know When You Are Done Having Babies? The decision of whether you are done having babies or not is a very heart-wrenching one for many parents. After McKenna (our third) was born, we immediately started talking about whether we were done or not. Pregnancy is hard on me to say the least and my husband didn’t want to see me face another pregnancy. During the 2.5 years from when McKenna was born to when I got pregnant with Brinley, I pondered, read, prayed, and sought counsel from any person who would offer it. Here is the wisdom I gathered through the years and since. Your first step is to sort through your feelings. Do you want more babies? Does your spouse? Does the idea of another child fill you with excitement? Does the idea of stopping make you sad? As you think about how you feel, there is one thing I must bring to your attention. I think most if not all women go through a mourning period when they are done having babies whether they are definitely ready to be done or not. I don’t know about you, but when I was a little girl and played house, I was playing with baby dolls. I was imagining myself being a mom to babies and toddlers. I wasn’t envisioning and dreaming of parent teacher conferences and braces. In saying that, I don’t mean that there aren’t things to totally love and adore about being a mom to older children–there are! What I mean is we spent years and years envisioning ourselves as moms, and that usually entailed having a cuddly little baby in tow. So sometimes we feel sad when we are done having babies just because it is the closing of a chapter that, while difficult, was magical. That new baby smell, those newborn cuddles, the little grunts while sleeping…those are precious moments we will never get again (until we are grandparents). When we were deciding if we were done or not after McKenna, I was so conflicted. So very conflicted. I loved the idea of never facing morning sickness again, but I didn’t feel at peace about being done. I literally prayed about it daily for 2.5 years. I talked to anyone who would listen to me. I would talk to people who were done, who weren’t done, who thought they were done once and, surprise! I talked to people who came from families of three children to convince myself that my children would be okay if they came from a three child family (for the record, I don’t think there is something wrong with a three child family. I just felt like that number wasn’t right when pondering and was trying to prove myself wrong. In the end, it was a feeling that three wasn’t right for us. Do You Feel Like Someone is Missing? Whenever I was doing a headcount, I would say to myself, “There is Brayden. Kaitlyn is right here. There is McKenna…where is the baby?” That feeling of having a child missing is THE BEST indicator in my opinion as to whether you are done or not. I thought so at the time, also. My trouble, at the time, was wondering if I was feeling a child missing who was to come or my child who did come but I lost. Was I missing Braxston or another child? I didn’t know. I can tell you now that I feel very confident that we are done (though I will say a surprise would never shock me! It happens). When I am doing headcounts, I never think, “Where is the baby?” I count and feel I have found everyone. Let me give this one more piece of advice. I did find that when Brinley moved to one nap, I would often think in the morning, “We need to be quiet! The baby is sleeping!” But she wasn’t. She was awake. I did wonder for a time if that was me thinking of a missing baby, but in the end it was just me being in the habit of having a sleeping baby in the morning for the past 9ish years. Some thoughts are just deeply ingrained habits. Talk out your feelings with your spouse and possibly trusted friends and family members. Often times, talking out how you feel really helps you realize how you really feel. You can also talk it out with yourself in a journal. Once you really know how you feel, try praying about it. Let the Lord know how you are feeling and see what sort of response you get. I have noticed that people get different answers when praying. Some get a “You are done.” Some get a “You are not done.” Some get a “It’s up to you.” Some get a “Not yet.” Some get basically nothing, which is what I got for 2.5 years. During that time, I read a talk where the speaker said to be grateful for the times you had unanswered prayers. He said it was a time the Lord was strengthening you. You all know how I like to plan. That time period was definitely a long period of time where I finally gave up and decided I would accept the Lord’s timetable and accepted that I don’t have to know everything right now. I definitely grew as a person during that time. What About When You Disagree? It is hard when you and your spouse do not feel the same about an answer on having more kids, and this happens very, very often. At some point, someone is going to either feel differently or as a couple you will go against what one of you feels. My husband felt strongly that we were done having kids. As I have mentioned, I felt conflicted. Finally one day, I had a thought. I thought we should try for three months and if we didn’t get pregnant in that three months, we would take that as our answer and be done with it. I proposed this idea to my husband and he thought that sounded great. The rest is history! We have our 3 year old Brinley and now we both agree it was the right thing :). Once you have come to a joint conclusion, try acting on it. About 18 months after McKenna was born, I decided since we were done having kids, I would get rid of our baby clothes. I went to the girl clothes first. I found about 5 things I was willing to part with in the 18 months worth of clothes I had to choose among. Huge sign! I thought I might not be ready. After Brinley was born, I had no trouble giving away my maternity clothes and my baby clothes. There have been a few outfits I have kept for sentimental value, but I am keeping about 5 rather than giving away about 5. Not to say that there haven’t been plenty of people who have given everything away just to have another baby soon thereafter. My point is to try acting on what you think is right and see how you feel as you act on it. If you feel good about it, continue on. If not, reevaluate. For some people. the decision is clear as to when they are done. For some, the decision is made for them. For some, it is a process that requires much pondering and much thought. Always remember the decision is personal for each couple. There is no one right number of children. There is no age when you should be done or no age you have to continue until you reach. You can know what is right for your family, and while you may mourn what you are leaving behind when the time does come to be done, you can feel a sense of peace that you are past that portion of your life. Today the ladies of the BFBN are all sharing posts talking about sibling dynamics. Topics include ways to help the sibling relationship, benefits of structure, why you want a strong sibling bond, and if you would even want your first born to have a sibling. Thanks so much for sharing your heart on this! I am toward the end of my second pregnancy…our girls will be 22 months a part. My husband feels that we are done. I had always envisioned a larger family and am definitely mourning the loss of that dream. I already feel like someone is missing and our second child isn't even here yet! ha! Pregnancy is very difficult on me also, and I think that has a lot to do with my husband's decision. He also shared the feelings of neglect he had when our first daughter was born because she took up so much of my time – I thought I had done well balancing my roles, but I'm glad we discussed it before our second has arrived! We've agreed to table the discussion until I am no longer pregnant and get through those glorious/exhausting newborn months – raging hormones do not make for good conversations for me 😉 May I ask how you all handled being done or can we open the door to discuss permanent birth control options? That's getting pretty personal but that's a major part of my conflict because I have strong feelings one way and my husband's feelings are opposite, so it's hard for me to reconcile the two. Elizabeth–I won't do anything that is hormonal for me. That has. Ever gone well–even low dose hormones make me a crazy person. I don't like permanent things unless there is some medical reason for it. That is personal belief based. We just primarily pay attention to ovulation cycles. I like the app "pink pad" for tracking that. It is a free app. Great and necessary article. Tenderly written. I was so excited to give away everything- EVERYTHING- when our third child was about 14 months old. A few months later- SURPRISE! I didn't tell anyone- even family- for about five months. My husband jokes that my jaw was still on the floor in disbelief even when sweet surprise was 9 months old lol. True, it was a deep shock for me. But wonderful sweetie pie is here, now nearly 3 years, and our family is complete.